Whoever has been part of the online marketing world for more than a year knows that there’s a constant frenzy around what’s going to be the next big thing. This is fueled by sleazy marketers who push new marketing channels like candies to get some quick bucks out of the least experienced who are looking for magic bullets. And it’s supported by the fact that marketing channels tend to get easily saturated and harder to get ROI on. 2017 and 2018 have been the year of LinkedIn for me. No other platforms besides SEO have ever performed so well in terms of ROI for my businesses. However, as I’m slowly shying away from an agency model to focus more on different ventures I’m invested in, I started to use that platform less. It’s 2019, and I just turned 24. I spend the past 2 years dealing with client calls and don’t get me wrong, I enjoy the process. But I now feel like it’s time to take more significant risks and at the same time enjoy more the perks of running a location independent business. When I launched my agency about two years ago it was my first time running a service business, and I failed in understanding how to structure it properly. The obvious result has been that the business and performance for the clients were overly reliant on myself only, and it didn’t allow me to focus enough on what I can do best. The launch of a brand for ambitious men (both digital and physical products) I’ve been working on with a fellow entrepreneur and huge friend of mine. Deliver top-notch results for the few clients that I decided to accept. 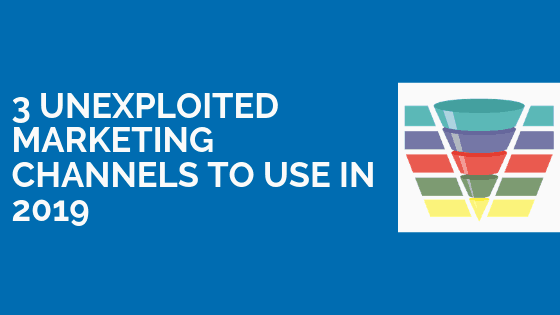 To achieve these results, here are three marketing channels that I overlooked in the past years and that I think deserves to get more consideration in 2019 for their vast unexploited potential. I know, I know. Seems like everyone has been praising the value behind YouTube for a year now, but I failed to grasp it because of my bias towards text-based content. Since 2007 I’ve been building sites around my written content solely, and as much as I like YouTube as a learning channel, I still prefer to read articles and blog posts most of the times. However, I believe that no other marketing platforms right now have the same potential of YouTube. It’s a search engine, as powerful as Google in helping potential customers to discover you and your business. The average session time it’s 40 minutes! The potential ’s crazy. If you’re skillful enough in creating engaging videos your followers will spend hours and hours of their life hanging out “virtually” with you. You can always outsource content (now even to A.I.!) but not your image on a video. It allows to build trust and provide value on a mass scale. It’s very hard to explain emotions on paper or to prove that you aren’t sleazy or have bad intentions. But it’s easy peasy to do it by shooting a video. Brian Dean of Backlinko once said that he was about to quit YouTube as a channel until he checked his customer feedbacks and most of his buyers were mentioning his videos as the reason that convinced them to buy! It’s a win-win. YouTube wants people to remain on their platform as much time as possible. You want potential clients to follow you and watch your content as much as possible. It’s a win-win with YouTube. You both want people to consume your valuable content. There’s still untapped potential. When I said this to a friend of mine for the first time he reached like this: “Dude, are you kidding me? Seems like everyone has a YouTube channel!” My opinion is instead that it’s still largely untapped and it will remain like this still for a while. Do you remember in school when someone had to speak in public for a presentation? Most of my peers were very afraid of doing it. Some would have preferred to fake their own death instead of speaking in front of 150 people 😀 The truth is, there are lots of people in every industry who know what they’re doing in, but most of them will prefer to remain in their comfort zone or they just hate to be seen publicly. It’s fine, I understand it, but they know that they’re leaving money on the table by doing this. I’m probably going to experiment soon with YouTube ads as well, they tend to get more expensive than other platforms but I can see the value. I’ll update you more in further posts. Different months ago, I met with a friend from the US. What I noticed is that she was using Snapchat all day for all her communication! Chance wanted too that I stumbled across a Snapchat Ads course online, and I’ve been blown away by the (proven) results the instructor has been getting! As a advertising platform, Snapchat has been largely overlooked because of some structural problems that made it extremely expensive in the past. Currently, you can launch your campaigns starting from as low as $ 20/day or $ 140/lifetime. What I’ve found is that right now they’re largely inexpensive compared to Facebook, Instagram Ads, and Adwords and became a good addition in my marketing stack. Is Snapchat here to stay? I have no idea, but the company it’s trying every sort of innovation to get more revenue now that they’re public. It will surely be here for long. I plan to experiment more with it in the future for an upcoming offer I need to promote. If you want to get to know more about Snapchat Ads, hit me a message. If there’s enough interest I’ll be happy to publish a quick guide sharing my learnings. If you’ve been following me for a while you know that I love chatbots and Messengers Ads. Messenger Ads are still untapped and cheaper than usual. Many people think that to set up a chatbot and a Messenger Ads campaign it’s a technical process. The truth is, it is a tedious work to get the right sequences up and running, but it’s well worth it and everyone can do it. Messenger Ads are often inexpensive and offer a fantastic user experience for your clients, that will consequently want to engage more with your message and offer. When someone connects to your chatbot, whether through Messenger Ads or organically, you can both capture their e-mail and you have the chance to reach out to him again on Messenger! How cool is that! You now have two different ways to nurture this lead and reach out to him as zero cost. People don’t leave their e-mail anymore as easily as in the past on websites. By asking for their Messenger access you have the chance to deliver a different experience and get heard more. Mark Zuckerberg clearly declared that Messenger it’s now even more central in Facebook’s plan. This isn’t a new marketing channel, but this year I’m focusing more on providing a top-notch user experience on my pages by make sure that they load fast and even more by improving how I structure the content. As Google is getting smarter and smarter in understanding the content of a page and the relative value of it for the user, links are going to be worth less than on-page optimization focused on customer experience. This has been an ongoing process that started years ago. However, it’s now time to take it more into consideration if you haven’t yet. What are the main channels you’re going to focus on in 2019 for your business? Reply in the comment section below!